There has been a recent expansion of interest in cultural approaches to rural communities and to the economic and social situation of rurality more broadly. This interest has been particularly prominent in Australia in recent years, spurring the emergence of an interdisciplinary field called 'rural cultural studies'. 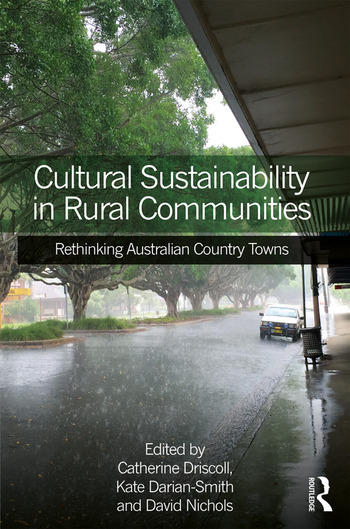 This collection is framed by a large interdisciplinary research project that is part of that emergence, particularly focused on what the idea of 'cultural sustainability' might mean for understanding experiences of growth, decline, change and heritage in small Australian country towns. However, it extends beyond the initial parameters of that research, bringing together a range of senior and emerging Australian researchers who offer diverse approaches to rural culture. The essays collected here explore the diverse forms that rural cultural studies might take and how these intersect with other disciplinary approaches, offering a uniquely diverse but also careful account of life in country Australia. Yet, in its emphasis on the simultaneous specificity and cross-cultural recognisability of rural communities, this book also outlines a field of inquiry and a set of critical strategies that are more broadly applicable to thinking about the "rural" in the early twenty-first century. This book will be valuable reading for students and academics of Geography, History, Literary Studies, Cultural Studies, Anthropology and Sociology, introducing rural cultural studies as a new dynamic and integrative discipline. 11. Broome’s economy: renaturalising neoliberalism? Catherine Driscoll is Professor of Gender and Cultural Studies in the School of Philosophical and Historical Inquiry at the University of Sydney. Kate Darian-Smith holds joint appointments at the University of Melbourne as Professor of Australian Studies and History in the School of Historical and Philosophical Studies and as Professor of Cultural Heritage in the Faculty of Architecture, Building and Planning. David Nichols is Senior Lecturer in Urban Planning in the Faculty of Architecture, Building and Planning at the University of Melbourne.